The Curtain Theatre's well preserved remains were uncovered in June 2012 by archaeologists from the Museum of London who had undertaken exploratory digs at what was thought to be the site of the Theatre, one of the earliest Elizabethan Playhouses in the Country. Earlier research had resulted in a commemorative plaque being placed on a building at 18 Hewett Street as early as 1993 and this latest dig in 2012 revealed that the Theatre was actually only a stones throw from this location. 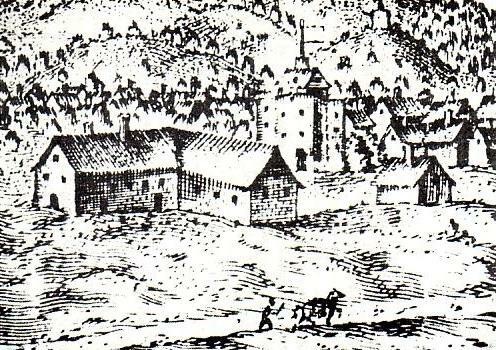 Right - A Drawing showing the Curtain Theatre at the centre of the image with a flag flying - From 'A View of the Cittye of London from the North' Circa 1600. At present only a small part of the Theatre has been revealed, including the yard and the gallery walls, but it is none the less an impressive find. It is thought that the Theatre would have been polygonal shaped with an external diameter of 22 metres. The Stage itself would have been situated on the eastern side of the building with the entrance on the West off Curtain Road itself. The site itself is soon to be built on but Plough Yard Development, who have been granted planning permission to develop the site, will be excavating the site further, and featuring the remains as a major part of its £750m mixed commercial and residential development of the site. It is thought that Shakespeare's 'Henry V' was first performed at the Curtain Theatre in 1598, indeed the play's prologue even refers to the Theatre mentioning 'this wooden O' in the text. At this time Shakespeare belonged to the Lord Chamberlains Company of actors, who had moved from The Theatre, only 200 yards north of the Curtain, in 1598 whilst their new Theatre, The Globe on the Southbank of the Thames, was being constructed. The Curtain Theatre was built in 1577 and was the second playhouse in London after The Theatre, 200 yards to the north, which opened a year earlier. The Curtain Theatre seems to have been named after Curtain Road which was itself formed as the perimeter wall of Holywell Priory which was situated just to the road's north. In 1567 the area to the east of Curtain Road was known as the Curtain Estate. The Theatre is thought to have been built by Henry Lanman, or Laneman, who was described as a gentleman and a minor courtier. He is known to have made a financial deal with the Burbage family who owned The Theatre which resulted in the profits from both playhouses being shared with each other. Who actually played at the Curtain Theatre is a matter of some conjecture but it is known that Lord Arundells Players were there in 1584, the Lord Chamberlains Players in 1598 and 1599 , the Queen's Men in 1603, and a so called amateur companie of young men performed The Travels of Three English Brothers by William Rowley, John Day and George Wilkins at the Curtain Theatre in 1607. There are also records of fencing matches and boxing tournaments being performed in the building in later years. In 1638 the Theatre was converted into Tenements and seems to have been still standing as late as 1698 in this use. You may also be interested in a new Website called Shakespeares Buildings, a photographic resource detailing the buildings and places associated with William Shakespeare. Also known as - The Cambridge Music Hall, this Theatre was built at a cost of £16,000 with a capacity of 2000. It was designed by Finch Hill (see details below) and opened in 1864 but by 1892 the capacity had been limited to 1,488. The building was destroyed by fire in 1896, and although it was rebuilt and opened again in 1898, see cuttings below, it was demolished in 1936 for the extension of a tobacco factory. 'The New Cambridge Music Hall in Commercial Street, Bishopsgate, is now nearing completion. The stage will be 41ft wide by 30ft deep . The premises will be heated throughout by hot water coils, and provision has been made for lighting the house by electric light.' - THE BUILDER December 4 1897 - Courtesy John Grice. Right - The Royal Cambridge Theatre - From 'The Architect' January 20th 1899. Arthur Lloyd is known to have performed here in 1879 and 1903. 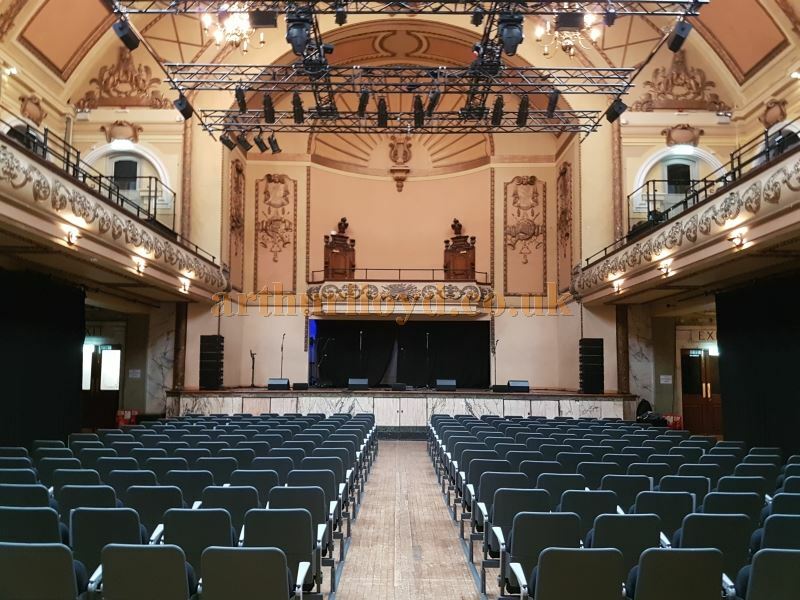 'The New Cambridge Music Hall, Bishopsgate, which was burnt down some time ago, having been rebuilt, has now been opened to the public. Left - The Site of the Royal Cambridge Music Hall in 2004 M.L. There are eight entrances in Commercial Street, and four separate exits are provided for the pit and gallery, with an additional exit from the latter delivering into Vine Court. A saloon has been provided at the Commercial Street level. The pit and stalls floor is about 10ft below the level of Commercial Street. The total seating accommodation for the stalls, pit, private boxes, circle. and gallery is 2,000 persons, with standing room in the rear of each tier for another 300.Mr Harry Percival was the architect.' - THE BUILDER January 15 1898 - Courtesy John Grice. 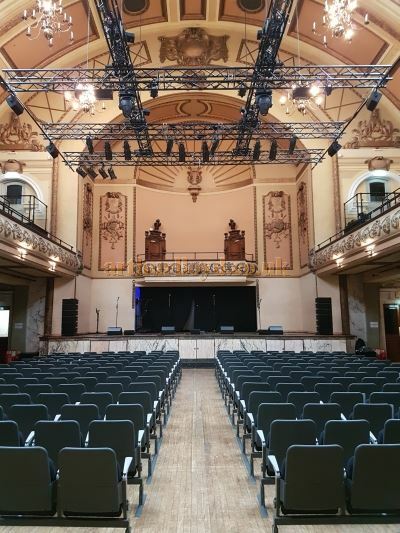 Finch Hill went on to design Weston's Music Hall (1857), the Britannia Theatre, Hoxton (1858), the Oxford Music Hall (1861), the Royal Cambridge Music Hall (1864) and the Philharmonic Hall, Islington (1866) . The architecture of these halls was considerably chaster than the entertainments which took place in them. Finch Hill was a master of the opulent but never licentious classicism of the 1850s. Audiences knocked back their beer in sumptuous settings designed by an architect who knew the churches of Gibbs, Archer and Hawksmoor. With the exception of the Britannia none of them had any proper auditoria; this, incidentally, was the main reason why none of them survived, for in the course of the century the form of the music halls was to develop closer and closer to that of the theatre and they were rebuilt as a result. Finch Hill's inspiration was literally ecclesiastical; his halls had level floors and galleried isles leading the eye to a ceremonial culmination above a raised platform at what one is tempted to call the ritual east end. - Victorian Pubs by Mark Girouard. Studio Vista 1975. Courtesy John Grice. My early appearances were usually in the East End Halls. These were the days of the 'Chairman' - Mr E V Page at the Cambridge - who used to introduce each turn in his sonorous voice. I was at the Cambridge at the height of the Jack the Ripper scare. One of my songs had a chorus referring to the well know French system of the claque. Although very few people realise it, the claque actually existed in the London music halls in my very early days. I remember once being stopped outside the stage door of the Cambridge with the request that I would 'remember the Gallery Boys'. I innocently replied that I would always remember them. The spokesman then made it plain that I would have to give them a weekly sum, for which they were prepared to applaud me vigorously, or else.... the alternative would be most unpleasant. That was the only time I was approached by what was then a recognised thing in the Halls. From - 'TAKE IT FOR A FACT' (A record of my seventy five years on the stage) by Ada Reeve - William Heinmann 1954 - Courtesy John Grice. The National Standard Theatre was built on the site of the Royal Standard Public House and Pleasure Gardens, and first opened in 1837, it was situated opposite the Eastern Railway Station. The Theatre was rebuilt in 1844 by Messrs Johnson and Nelson Lee, who was the former manager of the Pavilion Theatre, Whitechapel. They demolished the old Standard Theatre and rebuilt it on a much larger scale. The new Theatre had a duel purpose, that of a playhouse and a circus arena, and was decorated in the same style as the Franconi's Circus in Paris. The Theatre's normal stage could be made to travel out of the way, revealing underneath, a circus ring 400 feet in diameter, which could also be filled with water for water features. Right - A Poster for a Benefit for T. C. King at the National Standard Theatre in 1887, with Arthur Lloyd, and Katty King both performing - Click to Enlarge. The Theatre opened in January 1845 and a few months later the Illustrated London News reported on the Theatre in their 17th of May 1845 edition saying:- 'The East-enders have now their Amphitheatre, or Cirque Olympique, for equestrian performances, which the proprietors of the New Standard Theatre have just provided for, in a novel and ingenious manner. This little Temple of the Drama was erected a few months since, on the site of twelve houses, adjoining "the Standard Theatre," by Mr. John Gibson, for the proprietors, Messrs. Johnson and Nelson Lee. It faces the Terminus of the Eastern Counties Railway, in Shoreditch. The interior is of the horseshoe form, and a domed roof, a construction peculiarly well adapted for the transmission of sound. The proscenium is 30 feet wide by 30 feet in height; the auditory has a circle of ten private, and fourteen public boxes, which, with the pit and gallery, will accommodate 2200 persons. It is lit by a cut-glass chandelier; the fronts of the boxes are coloured in two drabs, relieved with gold mouldings, pilasters, equestrian medallions, &c.
The above text in quotes was first published in the Illustrated London News, 17th of May 1845. Johnson and Nelson Lee relinquished control of the Standard Theatre in May 1848 at the end of the season. 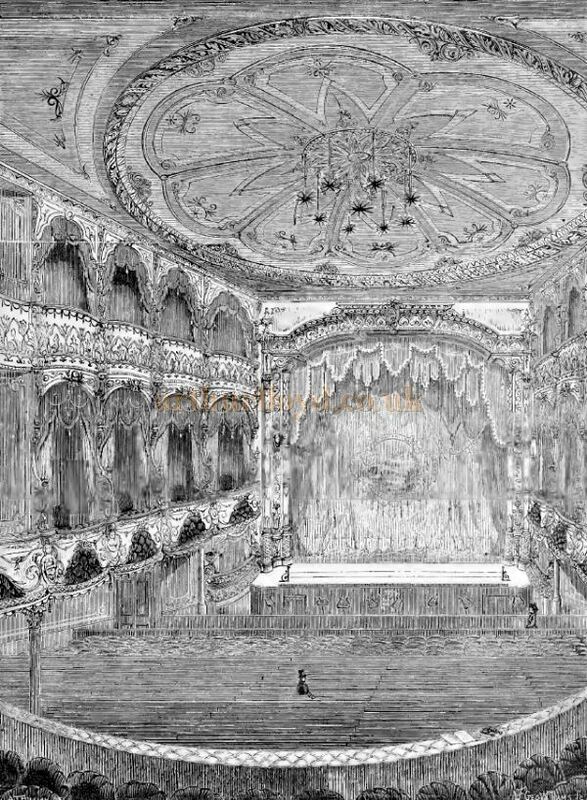 The new lessee and eventual owner was Mr John Douglas, previously of the Marylebone Theatre, who remodeled and redecorated the Standard Theatre during the recess from May to September, and reopened it on September the 30th 1848. Johnson and Lee Nelson later took over the lease of the City of London Theatre in Bishopsgate. 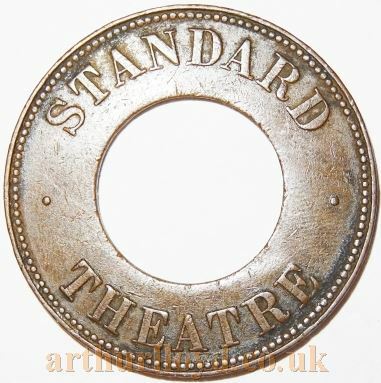 Above - An Early Entrance Token for the Standard Theatre, Shoreditch under the Management of John Douglas - Courtesy Alan Judd who says 'Usually the Holes in Tokens of this sort were to enable different types of token to be distinguished in difficult lighting. The same principle was used for market tokens. An alternative was to use different shapes, but a hole was a cheaper alternative. The Standard Theatre was destroyed by fire a few decades later, on October the 28th 1866, but was then rebuilt by John Douglas the following year and it reopened in December 1867 with a seating capacity of 3,000. The Building News and Engineering Journal reported on the soon to be erected Theatre in their 5th of July 1867 edition saying:- 'The foundation stone of a new theatre upon the site of the Standard Theatre, burnt on October 28, 1866, took place yesterday afternoon. Mr. John Douglass has since then purchased the freeholds of some adjoining property, and thus obtains room enough to build a theatre larger than any one in London, excepting Her Majesty's. The main building is 149ft. long and 90ft. wide. The extreme height of the auditorium part is 84ft., and that of the stage 94ft., to give room for drawing up the scenery, which will not any of it be used from the sides. The stage from the footlights to the back is 61ft., and the widest part of the horseshoe is 56ft. The lower part of the house will be the usual pit and stalls, but the other part of the house will differ from any theatre yet seen in London. It will have three tiers of boxes in the form of balconies supported upon iron brackets bolted into iron pillars, not seen from the front of the house. These run up to the gallery at the back of the boxes, and so support it. The above text in quotes was first published in the Building News and Engineering Journal, 5th of July 1867. The Building News and Engineering Journal reported again on the new Standard Theatre, after it had opened, in their 27th of December 1867 edition saying:- 'The newly erected Standard Theatre, Shoreditch has been opened. The entire length of the building is 167ft. by 90ft. wide. The ceiling is a low pitched dome 70ft. in diameter and 10ft. in depth, and the audience portion partakes of the well known horse-shoe form, whilst the height from the pit floor to the centre of the dome is 84ft. 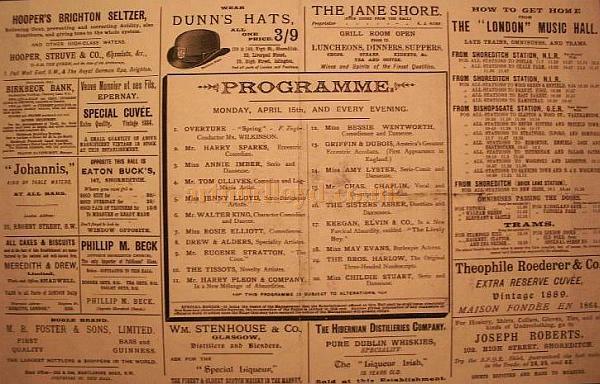 Right - A Programme for the National Standard Theatre for the week of the 2nd of March 1885. The above text in quotes was first published in the Building News and Engineering Journal, 27th of December 1867. 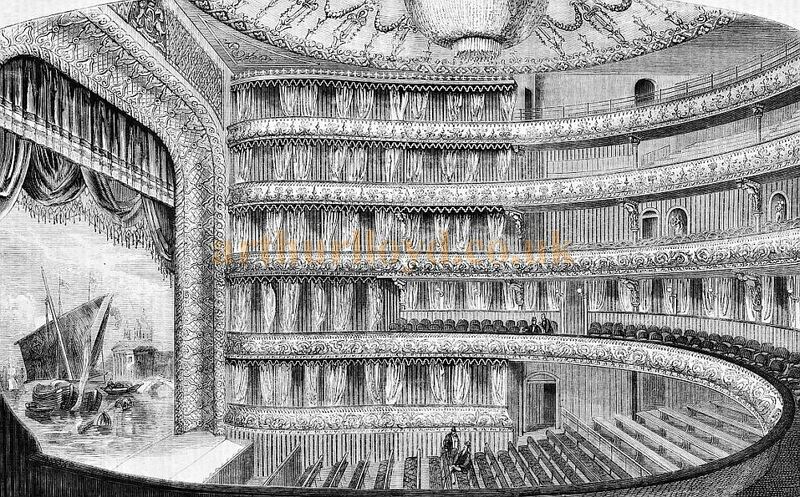 Above - The Auditorium and Stage of the National Standard Theatre in 1867 - From The Builder, 28th of December 1867. The Builder also reported on the newly built Theatre in their 28th of December 1867 edition saying:- 'The National Standard Theatre was burnt down in October of last year, and for some time the site remained unoccupied. In July, 1867, however, the first stone of a new theatre was laid; and last week the building was opened to the public. It is large and lofty, and we now give a view of the interior, produced under some difficulties. The ground upon which the old Standard stood has been considerably enlarged for the new theatre by the purchase of adjoining property. 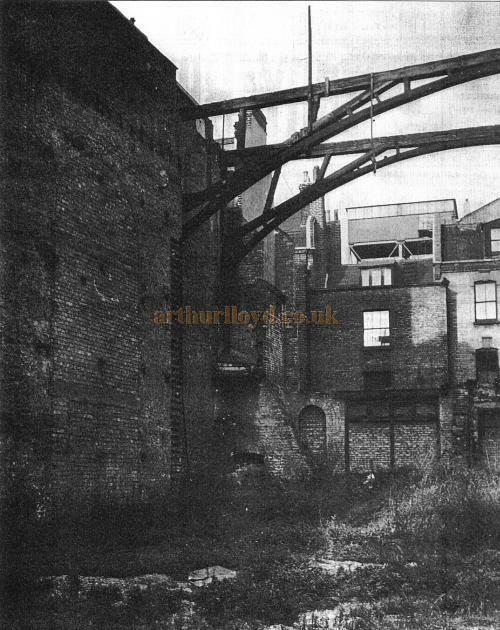 The site was originally that of the old Curtain Theatre, one of the most ancient playhouses in the metropolis. This theatre is mentioned as early as 1578, in a sermon at St. Paul's Cross. Ben Jonson exhibited his abilities here both as an actor and an author. Upon this ground Mr. Douglass has erected his new theatre. The main building is 167 ft. in length and 90 ft. wide. The height of the interior, from the pit floor to the top of the dome, is 84 ft. Within this space four tiers of boxes and a gallery are constructed, each one receding from the other, the lowest circle being 54ft. in width, the highest one 66ft. There are no columns visible in the front of the house. The first tier is a balcony of cushioned arm-chairs, covered with crimson velvet. Behind is a circle of comfortable little private boxes, fitted and lighted in a convenient manner. The shape of the interior of the building is a horse-shoe. The theatre is to be lighted by a massive crystal sunlight, by Messrs. Defries & Sons. All the staircases are of stone. The gallery staircase and the two at the side of the proscenium are carried the whole height of the building. From the main entrance in Shoreditch a double flight of stone steps conducts to a spacious lobby, where they break off to communicate in separate flights with the several tiers. This lobby is surmounted by a dome, rising 40 ft. The box saloon is large. An iron bridge spans this room, forming the main entrance to the third tier of boxes. Above the saloon, and running nearly the whole length of the front building, is a spacious room, which will make a concert or billiard room. There are ninety private boxes in the theatre. The decorations are mostly of papier mache, coloured and gilt. The above text in quotes was first published in The Builder, 28th of December 1867. Robert Whelan takes up the story of the National Standard Theatre saying:- John Douglass was an entrepreneurial manager who seized the opportunity to bring West End hits to his enormous theatre in East London. At the time East End audiences and West End audiences were felt to be completely separate, with no crossover, so there was no risk to West End managers of reducing their own business by such transfers. In 1856 The Times had congratulated John Douglass on bringing high-class productions to 'a public entirely isolated from the rest of London'. The Standard was often described as the Drury Lane of East London and, even before its rebuilding on a larger scale after the fire of 1866, the auditorium was described as looking very like that of Drury Lane. The scale of the Standard allowed Douglass to transfer the biggest West End shows, but he was also able to present Shakespeare and the poetic drama because Kingsland and Hackney were prosperous middle-class suburbs at the time, where many residents were ready to support a higher class of drama. Isabella Glyn, a great Victorian tragedy queen, gave Standard audiences her Duchess of Malfi and Hermoine from The Winter's Tale in 1868. 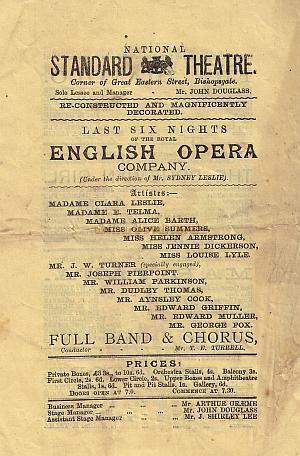 Douglass worked with Frederick Balsir Chatterton, the lessee of Drury Lane, to transfer Drury Lane hits to Shoreditch, including Lord Byron's blank-verse drama of Manfred, with its original Drury Lane star Samuel Phelps, in 1869, soon to be followed by Edmund Falconer's sensation drama Peep o' Day; Rebecca, a spectacular adaptation of Sir Walter Scott's Ivanhoe, transferred in 1872 with its West End cast, including a joust with real horses. It was so popular it was brought back the following year. This was followed a few weeks later by another Drury Lane spectacular: a revival of the fifty-year-old drama The Cataract of the Ganges in which the hero saves the heroine from death by sweeping her onto his steed and galloping up the eponymous cataract. In 1874 it was the turn of Amy Robsart, a stunning stage adaptation of Sir Walter Scott's Kenilworth that became the first show in the history of Drury Lane to run from the beginning of the season to the end, apart from the pantomime. Owing to its enormous scale, the Standard was one of the very few theatres that was able to take the Drury Lane scenery. In spite of this, the scenery was usually repainted, as Richard Douglass, son of the proprietor, was establishing himself as a scene painter. He took over the theatre on his father's death in 1874 and continued with his father' policy. It was not only Drury Lane productions that transferred to the Standard. 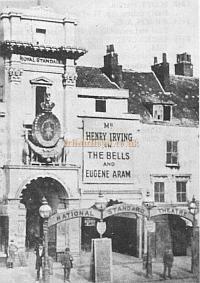 John Buckstone's Haymarket company travelled east with Oliver Goldsmith's She Stoops to Conquer in 1869 and Henry Irving took The Bells there in 1872, after its initial run at the Lyceum, and again in 1874. Right - The National Standard Theatre with Henry Irving on the Bill. From the book 'London Theatres and Music Halls 1850 - 1950' by Diana Howard. No wonder the Standard was called 'the national theatre of the East End'. - Robert Whelan 2018. In 1876 the Theatre was altered when its main frontage to the high street was rebuilt, along with other internal alterations. The Builder reported on this in their January 1st 1876 edition saying:- 'The National Standard Theatre in Shoreditch, although admitted to be the largest dramatic establishment in the metropolis - Covent Garden and Drury Lane not excepted - has hitherto had such an unpretending main frontage to High, street, opposite the Bishopsgate Railway Station, that a stranger would have some difficulty in finding its whereabouts. With the view of improving its external appearance, and at the same time giving increased facilities of approach to the auditorium of the theatre, the High-street elevation has just been entirely rebuilt, and the frontage to Bishopsgate increased in length from 12 ft. to 51 ft., and now presents an architectural exterior. In addition to the rebuilding of the frontage, the theatre has also been reconstructed to a depth of 110 ft. extending to the audience part of the house. 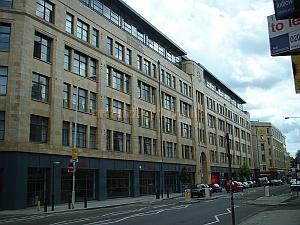 The new Shoreditch elevation is 60 ft. in height, and the style of architecture adopted is Modern Italian. The ground-floor portion consists of ornamental pillars, from which spring three bold arches. The upper portion is built immediately over the arcade, above which is a balcony with balustrade. From the balcony to the cornice the elevation is continued with piers, between which are three arched windows, and in the centre the elevation is surmounted by a pediment. The elevation at the north angle is surmounted by a tower rising to a height of upwards of 80 ft., and at this portion of the frontage there is a separate entrance, with a stone staircase, leading to an intended skating-rink in the upper portion of the building, altogether distinct from the theatre. In the centre, under the arcade, there is an entrance and staircase, 12 ft. wide, leading to the dress circle, stalls, and boxes. The walls of this entrance are divided into handsomely decorated panels, in which are placed mirrors 5 ft. in width and 12 ft. in height. The floor of the entrance is laid with encaustic tiles. Immediately adjoining the central entrance is another of exactly the same dimensions, and similarly finished and decorated, leading to the pit-stalls and upper boxes. 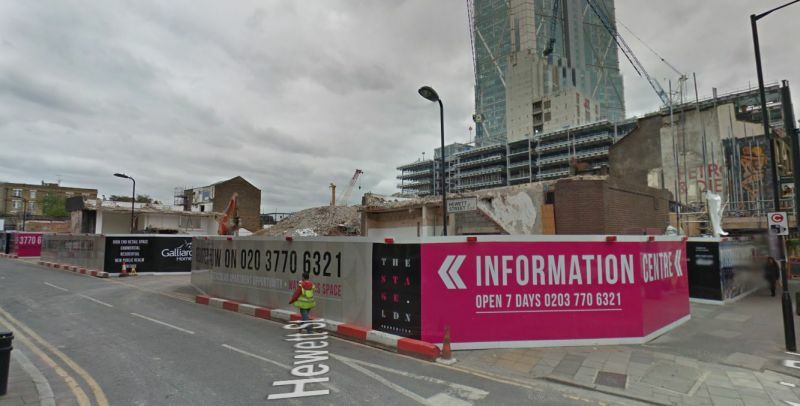 New entrances have also been made at the south side of the building, which will now face the new street from Oxford-street and Old-street to Shoreditch, at present in course of construction by the Metropolitan Board of Works. These entrances are four in number, one to the pit stalls, two to the pit, and one to the gallery. The above text in quotes was first published in The Builder, January 1st 1876. The Builder later wrote that Charles Fowler wished it to be understood that he had merely acted as district surveyor and not as the architect of the 1876 works . 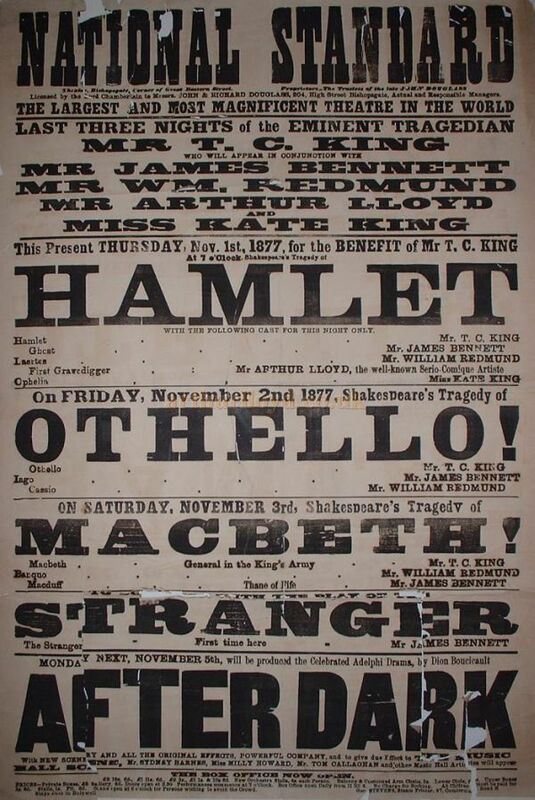 The following year, 1877, Arthur Lloyd, and his wife Katty King performed at the National Standard Theatre, see poster top right. Despite the 1876 alterations however, in 1889 the Theatre was rebuilt yet again, this time to the designs of the well known Theatre Architect Bertie Crewe, along with W. G. R. Sprague, and reopened as the Olympia Theatre, see details below. The Standard Theatre was rebuilt for a third time in 1889, this time to the designs of the well known Theatre Architect Bertie Crewe, along with W. G. R. Sprague. The Theatre was reopened as a Variety Theatre called the Olympia Theatre, under the management of Andrew Melville. It had a capacity of 2,463 and a stage 60 feet deep, with a proscenium opening 38 feet wide, and was equipped with 12 dressing rooms. Right - The Olympia Theatre, Shorditch - From - The Romance of London Theatres by Ronald Mayes, 1929, see article below. By 1911 the Olympia had become part of the Walter Gibbons and Charles Gulliver chain of Theatres and it wasn't long before films began to be shown as part of the variety shows. 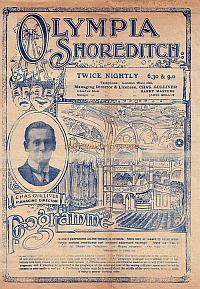 Left - A Programme for 'High Explosives' at the Olympia Shoreditch in 1917 - Click to see Entire Programme. In December 1926 the Theatre was converted for full time Cinema use and renamed the New Olympia Picturedrome. In 1930 the Theatre was taken over by ABC, Associated British Cinemas, who, in 1939, closed the Theatre so that it could be rebuilt along more modern lines. They planned to have the Theatre rebuilt as an Art Deco Cinema, designed by their in house architect William R. Glen, and demolition of the Olympia began the same year. However, with the outbreak of war the demolition was halted and the plans to rebuild the Theatre were never restarted. The Partly demolished shell of the old Theatre remained well into the 1950s, see image below, until the site was finally cleared. Sadly the new ABC Cinema was never constructed and that was the end for this particular site's theatrical history. Above - Remains of the former National Standard Theatre / Olympia Theatre, in the mid 1950s after its demolition and a failed start to build a new super cinema was halted by the war - From 'A portfolio of photographs' by Colin Sorenson, 'Theatrephile' Vol22-No5 - Courtesy Bishopsgate Institute Reference Library. 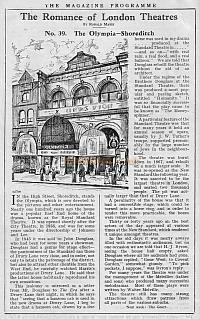 Another article on the Olympia Theatre and Standard Theatre, Shoreditch, by Ronald Mayes can be read below. 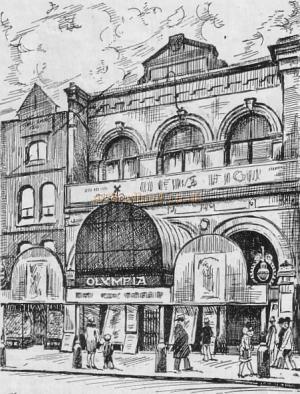 In the High Street, Shoreditch, stands the Olympia, which is now devoted to the pictures and other entertainment. Nearly one hundred years ago the house was a popular East End home of the drama, known as the Royal Standard Theatre. It was opened shortly after the City Theatre, in 1835, and was for some years under the directorship of Johnson and Lee. 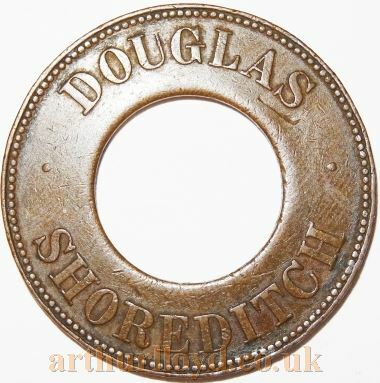 In 1845 it was sold to John Douglass, who had been for some years a showman. Douglass had a genius for stage effect - the pantomimes of the Standard ran those of Drury Lane very close, and in order, not only to retain the patronage of the district, but also to attract other clientele from the West End, he carefully watched Harris's productions at Drury Lane. He said that the latter house habitually reproduced his own sensations. This jealousy is mirrored in a letter from Mr. Douglass to the Era after a Drury Lane first night, in which he says that "seeing that a hansom cab is used in the new drama at Drury Lane, I beg to state that a hansom cab, drawn by a live horse was used in my drama . . . . produced at the Standard Theatre in ....... - and so on- "with real rain, a real flood, and a real balloon." We are told that Douglass rebuilt the theatre without the aid of an architect. Under the regime of the Brothers Douglass at the Standard Theatre, there was produced a most popular and paying sketch, entitled "Humanity." It was so financially successful that the play came to be known as "The Money spinner." 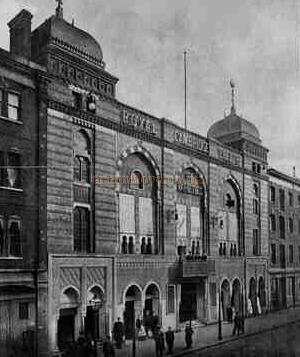 A particular feature of the Standard Theatre was that for many years it held an annual season of opera, usually by J. W. Turner's troupe, supported presumably by the large number of Jews in the neighbourhood. The theatre was burnt down in 1867, and rebuilt on a much larger scale. It was re-opened as the New Standard the following year. It was asserted to be the largest theatre in London, and seated two thousand people. The pit was actually larger than that of Drury Lane. A peculiarity of the house was that it had a convertible stage, which could be turned into a horse ring, and in order to render this more practicable, the boxes were removable. Thirty or forty years ago all the best actors of the day appeared at various times at the New Standard, which rendered it unique amongst theatres. In the old days it was nearly always filled with enthusiastic audiences, but on one occasion we are told that H. J. Byron, seeing the house half empty, asked Douglass where all his audience had gone. Douglass replied, "Gone West, to Covent Garden," somewhat glumly. " To pick pockets, I suppose," was Byron's reply. 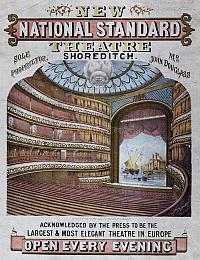 Left - A Poster for The National Standard Theatre with an image of the auditorium in 1867 - Courtesy PeoplePlay UK. For many years the theatre was under the management of the Melvilles (father and sons) who produced many successful melodramas. Most of these plays were written by Walter Melville. The theatre still has many strong attractions which draw patrons from all parts of the various suburbs. The above text was first published in 'The Romance of London Theatres' By Ronald Mayes, and is from a Lewisham Hippodrome programme for the 1st April 1929. Above - The Grecian Theatre as remodeled from the Grecian Saloon, in a photograph printed in 'The Sketch' December 21st, 1898. 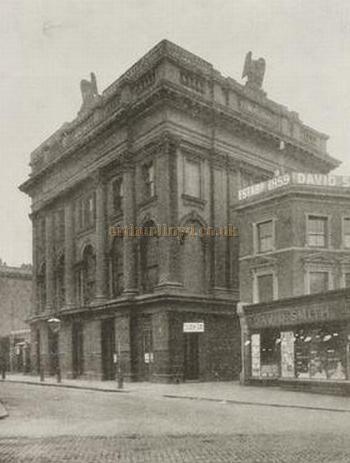 The Grecian Theatre was situated in City Road, Shoreditch and was originally opened in 1858 by Benjamin Conquest. The Theatre was a remodeling of an earlier 1841 building called the Grecian Saloon. (The well known Music Hall star Marie Lloyd was the daughter of John 'Brush' Wood, an artificial flower maker and former waiter at the Grecian Saloon.) The Grecian Theatre itself had a capacity of some 2,500 people when it first opened on Whit Monday, 24th of May 1858. The conversion from the Grecian Saloon included adding an extra tier of boxes and an additional gallery, with new entrances to the Pit, Boxes, and Stalls. The Theatre would go on to have several more reconstructions over the years, the last of which was in 1877. 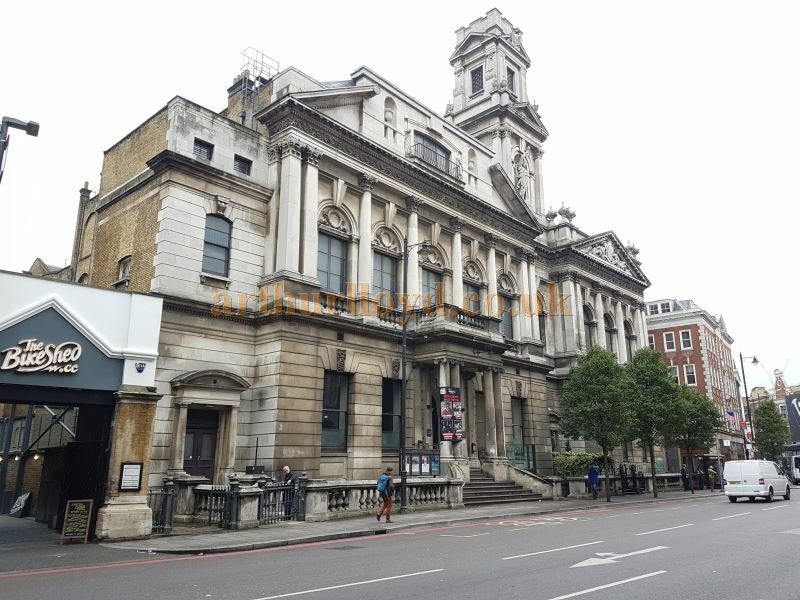 This 1877 Theatre was designed by J. T. Robinson and constructed by John Garrud of Spitalfields with a capacity of 4,000, see image and details below. Above - The 1877 Grecian Theatre, Shoreditch - Held in the Islington Public Library. 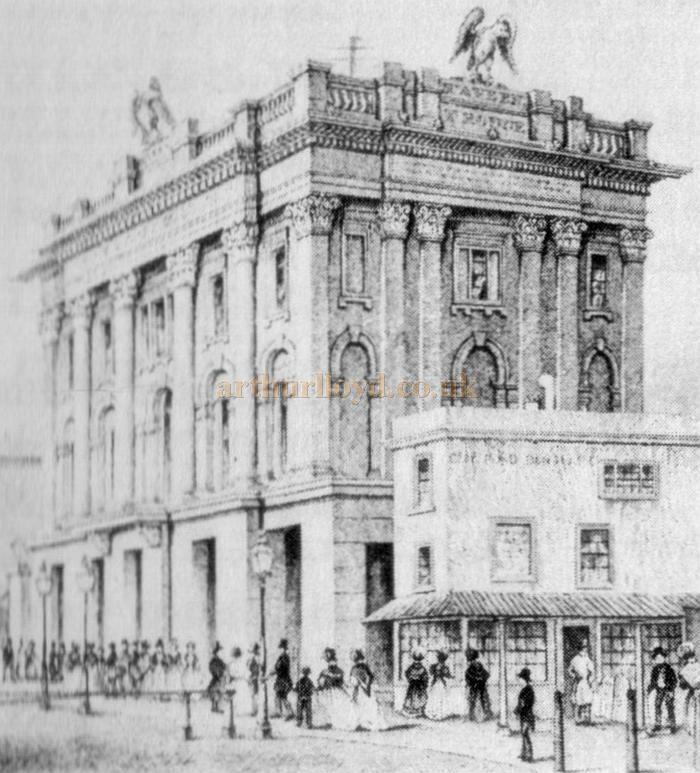 The Builder reported briefly on the history of the Grecian, and in more detail on the New Grecian Theatre itself, in their November the 3rd 1877 edition, along with plans and an image of the auditorium, shown below, saying:- 'To the Eagle Tavern, with its music and dancing, and "Bravo, Rons!" was attached in 1841 a capacious theatre, with all accessories necessary for performances, and we can remember seeing in it the great tragi-comic actor Robson, and hearing a strange story of his parentage. Afterwards came in the late Mr. Benjamin Conquest, who enlarged and improved the theatre, and then again reconstructed and enlarged it. This was in 1858. Here his son, Mr, George Conquest, who succeeded him, has drawn large crowds, too large, indeed, at Christmas time to be accommodated within the old walls. So now a new theatre has been built to hold, when closely packed, over 4,000 persons, and of this we give a view, looking towards the stage, and a plan. Our view, we are bound to say, does not convey an idea of the extent of the structure; it shows what may be called the dress-part of the house, leaving out of sight the deep dress-circle and huge gallery, which extend far away to the back. Right - The auditorium of the Grecian Theatre - From the Builder, November the 3rd 1877. The site chosen was the spacious dancing-hall. This building stands at right angles with the old theatre. Entrances to the pit, boxes, stalls, and dress-circle are given from Shepherdess-walk, and visitors will be able to reach the various parts of the theatre without crossing the grounds, as was the case in visiting the old house. To obtain headway for the raking gallery, four of the principals have had to be greatly raised; the last one about 20 ft. It is claimed, and we believe with truth, that from every seat in this gallery a good view of the stage is obtained; and an idea of its magnitude may be formed when it is stated that it will hold 1,600 persons. The ceiling, sides, and back are match boarded, stained, and varnished. This gallery is approached by a stone staircase, 8 ft. wide. There are three exits independently of this, all constructed of fire-resisting material. On this level are four private boxes at each side. The dress-circle is approached by a flight of stone steps, 10 ft. wide. Besides this, there are three extra exits, which can be used in case of need. At the back of this dress-circle is the saloon. The ceilings and walls on this level also are match-boarded, stained, and varnished. This match-boarding, indeed, is used all over the building where it can be substituted for plastering. This part of the house will accommodate about 800 persons. The pit will hold 1,700 persons, and the stalls, in addition, will accommodate 200. The decoration to the fronts of the boxes is in raised carton-pierre, painted white and gold, picked out in pink and blue. Blue satin is introduced into the dress-circle front, and, like the proscenium, is in a style which will doubtless be deemed handsome by the ordinary frequenters of the house. A depth, including the scene dock, of over 60 ft., is available on the stage for spectacular displays. 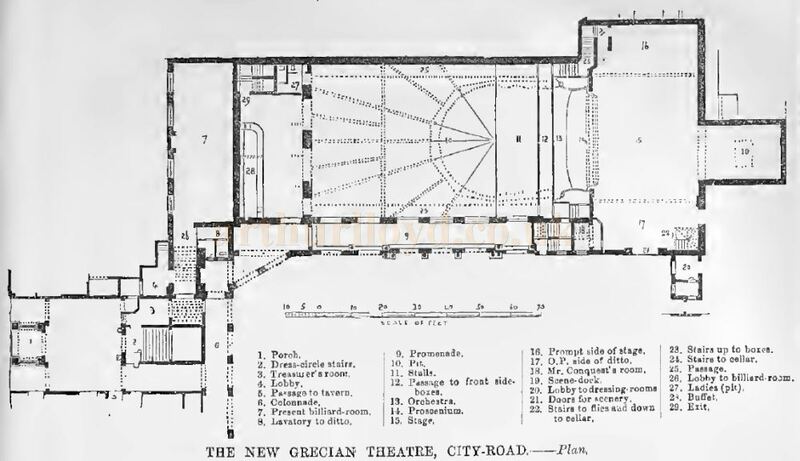 Above - A Plan of the New Grecian Theatre - From the Builder, November the 3rd 1877. Mr. J. T. Robinson, of Bloomsbury-square, is the architect. The work has been executed by Mr. John Garrnd, of Spitalfields; the decorations were carried out by Messrs. Pashley, Newton, & Young, of Red Lion-square; and Mr. J. H. Watson was clerk of the works. The above text in quotes was first published in the Builder, November 3rd 1877. The site of the Grecian Theatre is interesting as the first building was not only a reconstruction of the Grecian Saloon, originally built by Thomas Rouse in 1841, but was also attached to a public house called the Eagle Tavern which was named in the, still well known, song 'Pop Goes the Weasel'. The Eagle Tavern was constructed next to the pleasure Gardens known as the Shepherd and Shepherdess Gardens which had been created in 1825 and were later renamed the Coronation Pleasure Grounds in 1838 and survived until 1846. Arthur Lloyd is known to have performed at Mr. Holland's benefit at the Grecian Theatre on December the 4th 1862. He and his wife also performed there on the 29th of April 1882 for the Benefit of Herbert Campbell whilst Fred Fernandez, brother of James Fernandez, was working as the Box Office Treasurer at the Theatre. It was during this time when a false Fire call was yelled by some miscreant in the Pit on the 27th of December 1881, this resulted in a mass exodus of some 5,000 people in the audience. As luck would have it no one was seriously hurt, however it was a tense time for all those involved. Mr Clynds was the Theatre Manager at the time. The Grecian Theatre and the rest of the site of the former gardens were eventually bought by General Booth in 1882 for demolition and construction of grounds and buildings for the Salvation Army. However, it turned out that the deeds stated that the Eagle Tavern itself could not be demolished so Booth was forced to have a Public House selling alcohol right next to his Salvation Army quarters. 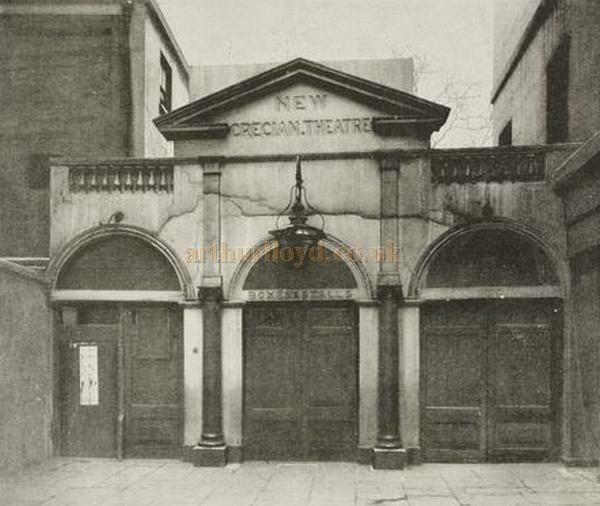 Right - The 1877 Grecian Theatre, Shoreditch in a photograph printed in 'The Sketch' December 21st, 1898. The above text in quote was first published in the Era, 4th June 1898. 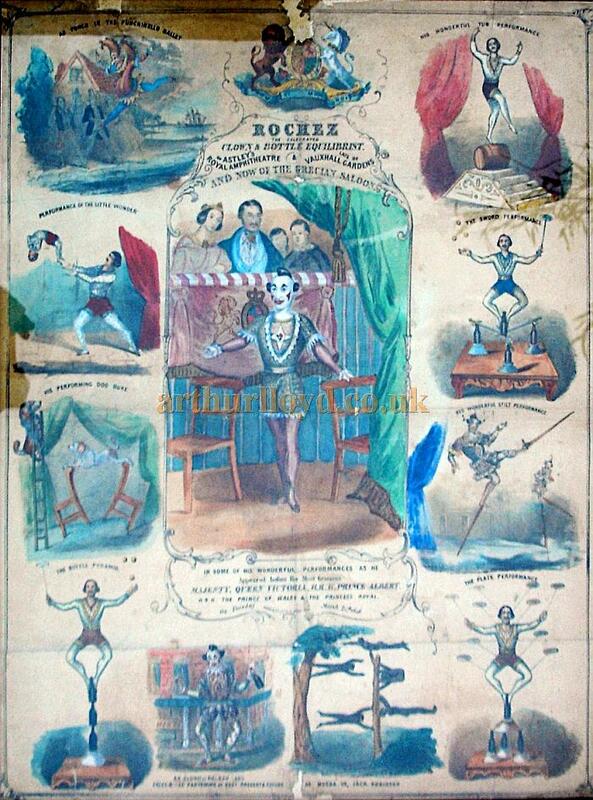 Above - A large coloured print from 1846 of Rochez 'the celebrated Clown & Bottle Equilibrist in some of his wonderful performances at Astley's Royal Ampitheatre & late of the Vauxhall Gardens and now of the Grecian Saloon' - Courtesy John Jones. 'The saloon theatres, always being taverns or attached to taverns, created a public who liked to mix its dramatic amusements with smoking and light refreshments. The principal saloons were the Effingham in the Whitechapel Road, the Bower in the Lower Marsh, Lambeth, the Albert at Islington, the Britannia at Hoxton, the Grecian in the City Road, the Union in Shoreditch, the Stingo at Paddington and several others of less importance. All these places had good companies, especially in the winter, and many of them nourished leading actors of exceptional merit. The dramas were chiefly rough adaptations from the contemporary French stage, occasionally flying as high as Alexandre Dumas the elder and Victor Hugo. Actors of real tragic power lived, worked and died in this confined area. Some went to America, and acquired fame and fortune; and among others, Frederick Robson, who was trained at the Grecian, first when it was the leading saloon theatre and afterwards when it became the leading music hall (a distinction with little difference), fought his way to the front after the abolition of the patent rights and was accepted as the greatest tragi-comic actor of his time. The Grecian saloon theatre, better known perhaps, with its pleasure garden or yard, as the Eagle Tavern, City Road, which formed the material of one of Charles Dickens's Sketches by Boz, was a place managed with much taste, enterprise and discretion by its proprietor, Mr Rouse. It was the "aloon" where the one and only attempt, with limited means, was ever made to import almost all the original repertory of the Opéra Comique in Paris, with the result that many musical works were presented to a sixpenny audience that had never been heard before nor since in England. Auber, Hérold, Adoiphe Adam, Boieldieu, Grétry, Donizetti, Bellini, Rossini and a host of others gave some sort of advanced musical education, through the Grecian, to a rather depressing part of London, long before board schools were established. The above text in quotes was first published in the Encyclopedia Britannica 1911 edition. Above - The Shoreditch Town Hall in November 2016 - Photo M. L.
The Shoreditch Town Hall is situated on Old Street and was built in 1865 to the designs of Caesar Augustus Long. It was said, on its opening in 1866, to be the grandest Vestry Hall to be built in London. 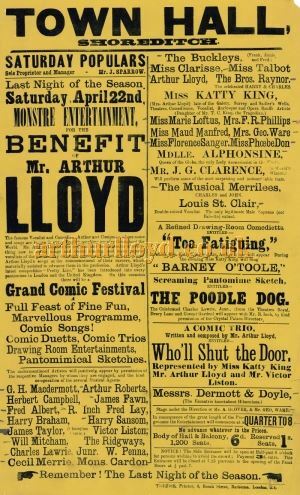 Right - A Poster for a Benefit for Arthur Lloyd with his wife Katty King at the Town Hall Shoreditch in 1882 - Click to Enlarge and for more details. Arthur Lloyd is known to have performed here in 1879 and 1882. The Town Hall has undergone many changes since it opened, especially in 1901 when it was subject to major expansion. Left - The Auditorium and Stage of the Assembly Hall, which is located on the first floor of the Shoreditch Town Hall, in a photograph taken in November 2016 - Photo M. L.
The Building News and Engineering Journal, 13th of September 1901. Above - The Foundation Stone for the 1901 expansion to the Town Hall Shoreditch seen here during renovation works to the building in June 2004 - Photo M.L. 2004. Above - An Exterior and Plan of W. G. Hunt's 1901 extended Shoreditch Town Hall - From the Academy Architecture and Annual Architectural Review of 1902. 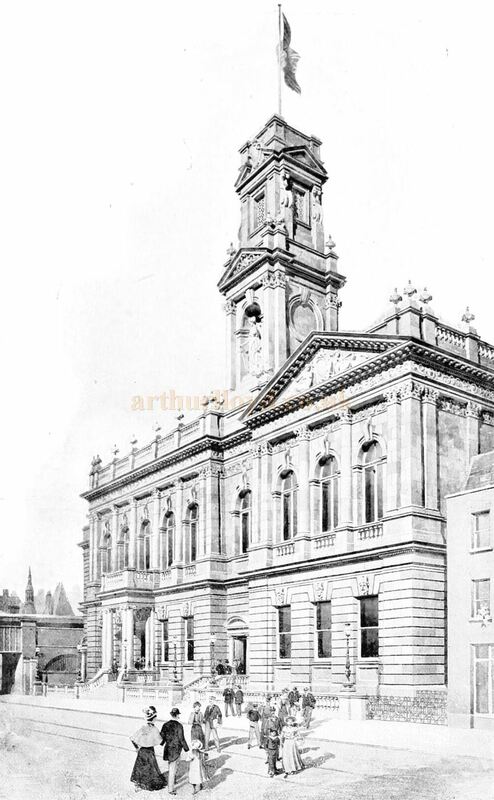 The Extended Town Hall reopened in 1902, but just a few years later a fire caused extensive damage to the Assembly Hall and the roof of the Council Chamber in 1904, however a new extended Assembly Hall was then constructed which opened in 1907. The Building was subject to major restoration work in the mid 2000s, reopening in 2004. And it was threatened with closure some years later, but was eventually saved and restored again in 2012, more on this below. Above - The Auditorium and Stage of the Assembly Hall, which is located on the first floor of the Shoreditch Town Hall, in a photograph taken in November 2016 - Photo M. L.
Above - The Auditorium of the Assembly Hall, which is located on the first floor of the Shoreditch Town Hall, in a photograph taken in November 2016 - Photo M. L.
After a concerted effort by a local community campaign to prevent the building being converted into flats by developers, the Shoreditch Town Hall was reopened as a new Arts Centre in July 2012. Local people raised £1.6 million by staging various events and the venue is now used to stage artistic and live performances. 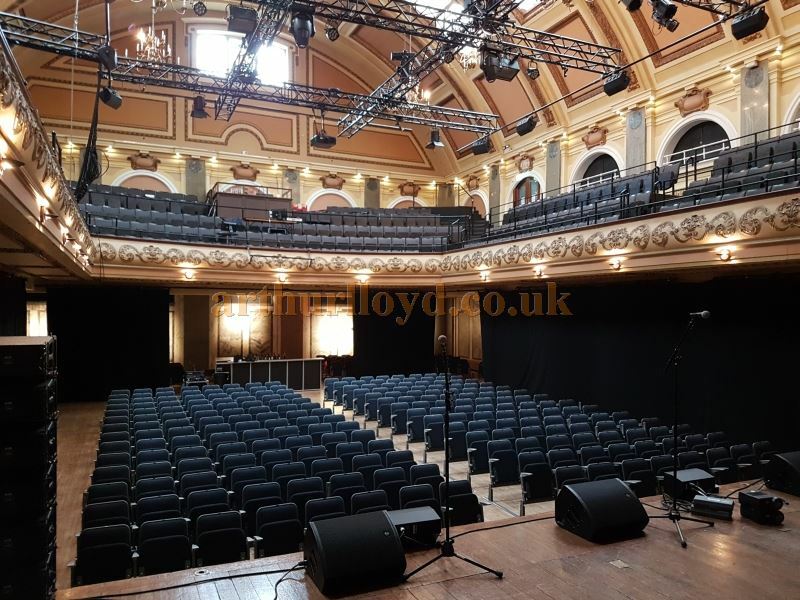 You may like to visit the Town Hall's own website here, where there is also a new section celebrating their 150 year history, along with an online, and printed, book which I was pleased to contribute to with an article on Arthur Lloyd and his connection to the venue here. Above - A Typical Music Hall Gallery. 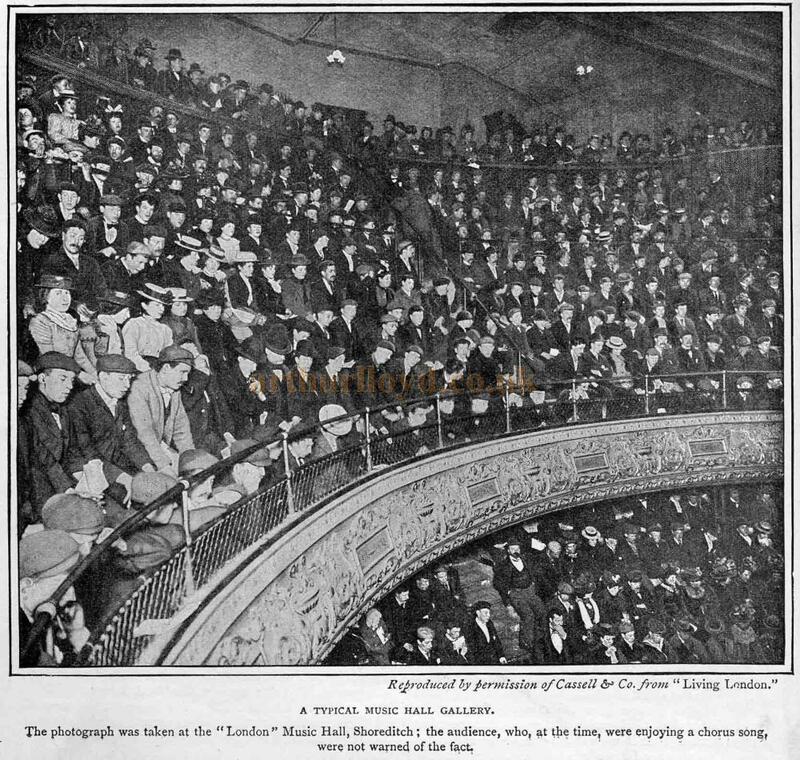 The photograph was taken at the "London" Music Hall, Shoreditch; the audience, who, at the time, were enjoying a chorus song, were not warned of the fact. - From 'The Playgoer' 1901 - Courtesy Iain Wotherspoon. The Shoreditch Empire was built in 1856 and was later reconstructed by Frank Matcham in 1894 with a capacity of 2,332. It was known as the London Theatre of Varieties in 1895, and for a short while as the Griffin Music Hall and Public House until 1896 when it became The London Music Hall. The Theatre was demolished in 1935. 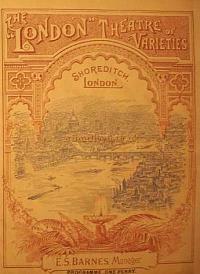 Right - A Programme for the London Theatre of Varieties - Courtesy Catherine Kent. See also in this vicinity: The City of London Theatre, Bishopsgate Wilton's Music Hall, Whitechapel. Above - Programme for the London Music Hall with a young Charlie Chaplin on the Bill. Also appearing were Griffin and Dubois of which there are more details below - Programme Courtesy Catherine Kent, Great Grandaughter of William Griffin. William Griffin was a fascinating man - quite the dandy - he married a dancer from the East end of London called Elly or Ellen - very beautiful apparently. They went all over the world but their home was in Syracuse NY State (it is still in situ!) and she used to visit and stay with family in Florida while he travelled performing. They had one son also called William who they sent to boarding school over here and that is my grandfather (now deceased also). He (called Dickie for some reason) was always doing acrobatic turns and lifting my father up as a baby and scaring everyone when he threw him about! William Griffin was certainly known by Stan Laurel and Charlie Chaplin and was famous before they were. Charlie Chaplin even wrote to my great grandfather once asking if he could give him a job! He called himself Griffin because his original name was Zimmerman - from Alsace Lorraine. The sensitivity was always there of the German sounding name so hence the change. He did have various partners from time to time - Dubois and Ardell - Dubois can be seen billed with Griffin in the programme above. Right - Cuttings from the Kent Messenger - Courtesy Catherine Kent.